Hyllingebjerg is located on the North Zealand (Sjaelland) coastline. The coastline consists both of large cliffs and shallow beaches. The erosion is structural; it is caused by a net sediment transport gradient in combination with human interference. Due to human interference – namely removing the large stones and local coastal protection measures – the sediment balance has been disturbed. The coast is no longer stable and structural erosion of the coast has begun. 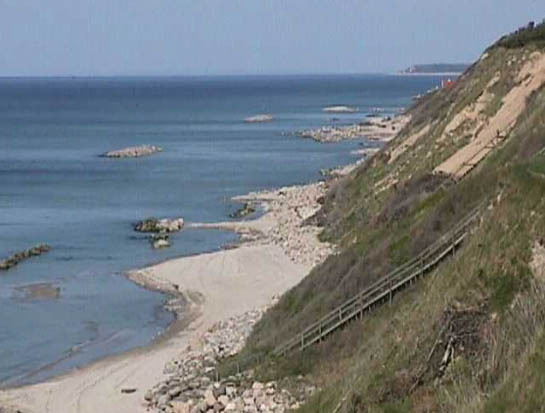 The erosion threatens existing summer cottages and beaches that are intensely used for recreational purposes. The purpose of the project is to protect the summer cottages at the top of the cliff and to do this in an environmental friendly and visually acceptable way with a set of various measures. The system of breakwaters, nourishment and slope protections has been successful. In general, the beach surface in front of the cliffs has increased and the cliffs are being protected more effectively. The breakwaters and beach nourishment reduce the wave impact on the slopes and thus reduce the requirement for slope protection. The summer cottages on the cliffs are no longer threatened by storms because of the wider beaches in front of the cliffs and the better slope protection that has been constructed.